(NaturalNews) In a sick experiment on humans that eerily resembles the horrors of the infamous Tuskegee syphilis study, which involved deliberately infecting hundreds of black men with sexually-transmitted diseases between 1932 and 1972, a cohort of researchers from at least 23 prestigious American universities is the center of a new controversy involving medical experimentation on premature babies. According to The New York Times (NYT), parents who allowed their children to participate in a recent oxygen study were not properly informed about the serious risks involved. These risks included blindness and death, both of which are common particularly among premature babies when the oxygen levels they breathe are either too low or too high. But the orchestrators of taxpayer-funded research involving both the deprivation and over-administration of oxygen to premature babies failed to disclose the severity of these risks to the babies' parents, which ended up coming as a surprise in the form of eye disease and early mortality. And a prominent government agency whose purpose it is to protect research participants from harm agrees. "[T]here is significant evidence from past research indicating that the oxygen provided to an infant can have an important effect on many outcomes including whether the infant becomes blind, develops a serious brain injury or even possibly whether the infant dies," explains the U.S. Office for Human Research Protections (OHRP) in a recent letter. The risks associated with participating in the trial, the agency adds, "were not the same as those receiving standard care." The study in question took place between 2004 and 2009, and involved 1,300 infant participants, all of whom were born early at a time between 24 and 27 weeks of gestation. These high-risk participants were assigned to either high- or low-oxygen treatment groups, and were subjected to said treatments for observation purposes. The results of the study were published in the New England Journal of Medicine (NEJM) in 2010. But after hundreds of babies died or developed eye disease, parents and others decided to take a closer look at the consent forms issued in conjunction with the study. It was determined, upon investigation, that the consent forms failed to mention either blindness or death as a possible outcome for infant participants, and instead only mentioned very minor risks such as abrasion to infants' skin that may occur as a result of being hooked up to an oxygen monitoring device. Worse, the same consent forms actually alleged that infant participants could derive health benefits from the treatments, including a lowered risk of needing eye surgery in the future. 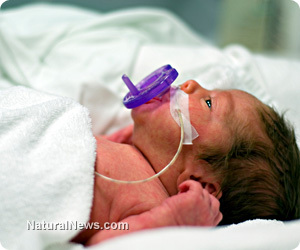 "[I]t [is] well recognized that changing a premature infant's amount of exposure to oxygen could have an impact on a number of important health outcomes, including the development of severe eye disease (and possibly blindness); reduced neurologic[al] development, including brain damage; chronic lung disease; and could even lead to death," adds the OHRP letter, noting that none of these risks were plainly disclosed in the study's consent forms. As pointed out by many commenters on the NYT article, OHRP's active response to this blatant violation of federal informed consent requirements contrasts with its complacency in addressing the nationwide experiment involving electronic medical records. Such devices are now being widely used despite having never received approval by the U.S. Food and Drug Administration (FDA), which means they are in clear violation of the Federal Food, Drug, and Cosmetic Act (FD&C).